While studying for a month in northern Michigan for an environmental ethics class back in January 2004, and being immersed in an outdoor-oriented lifestyle once again, I began to longingly think on my climbing accomplishments in past days, including my well-on-it's-way-to-being-completed goal of climbing or getting to the highest point in elevation of each of the 50 states, known as highpoints. I then thought of my plans to drive from the upper peninsula of Michigan through the province of Ontario, on my way back home in northern New York, and the thought occurred to me that each of Canada's provinces and territories had a highpoint too! I was in need of some new climbing goal, preferably one that would take me to new, remote, and wilderness places. 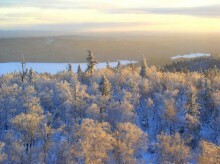 Being in remote northern Michigan had renewed in me a sense of longing for wilderness. Ishpatina Ridge PhotoAfter this revelation, I did extensive searching on the internet for information on Canada's highpoints, and finally found one personal website, one informational site listing actual highpoint data for each of the provinces and territories, and vague references to a book on climbing the highpoints of Canada entitled "Not Won in a Day." The personal website I found was created by a Canadian who had a similar highpointing goal, and he recounted his specific trip experiences on each of the highpoints he had so far attempted. 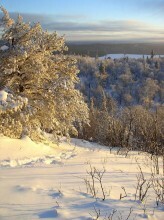 One mountain he had climbed was Ishpatina Ridge, the highpoint of Ontario. I discovered it was fairly close to Ontario Route 17 (only about 3 hours to the north one way), which I would be driving on, on the way home. I read with fascination about his adventures trying to navigate through 80km of logging roads leading north out of Capreol (which is north of Sudbury), crossing the Sturgeon River, and then bushwhacking from one wilderness lake to another for miles. It took him 3 days, in the summer, of course. 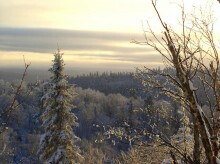 I decided to somehow try to reach Ishpatina Ridge in the middle of winter two weeks from then. I called home about my idea, which of course was met with great concern as I told them I planned on going 80 kilometers into the wilderness to climb a mountain by myself, in a cold spell with current nighttime temperatures reaching -30F. Nevertheless, my mom, who has always been a great help in planning and organizing my own adventures, started calling various municipalities and residences around the Sudbury area. She was able to confirm that the 80 km of logging roads used to access the mountain in the summer were not plowed this winter, and that no one in the area offered snowmobile rentals. 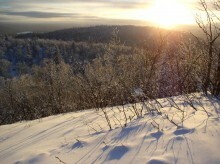 I had X-C skis and snowshoes with me, but I still didn't want to have to travel 80 km each way in the winter by foot. So I planned on driving as close to Ishpatina Ridge as I could, and then assess the access situation from there. In other words, I was basically just winging it. As crazy as this idea sounds, I found the spontaneity of it quite appealing. Ishpatina RidgeFinally, finals day came for my environmental ethics class, and I packed up ready to leave the next morning for the border at Sault Ste. Marie. On my last call home before leaving the campus, my mom pleaded with me to call her once more before I left civilization in Canada. So when I drove over the bridge to Ontario, I did stop and call her from the welcome center, which also had several helpful and detailed roadmaps. My mom was so excited when I called her. She had (somehow) managed to find the phone number of a lodge named Auld Reekie Lodge in the tiny town of Gowganda, Ontario (north of Ishpatina Ridge along Route 560), whose owner offered to guide me to the base of Ishpatina Ridge on snowmobile. This northern approach from Gowganda that he was suggesting was over 30 miles into the wilderness, and utilized a chain of lakes and portages primarily used in the summer by canoeists. This was a much better option, it seemed, than the 80 km of unplowed logging roads that made up the southern approach from Capreol. I agreed to drive the 7 hours to Gowganda that day, stay in the lodge than night, and make whatever arrangements I needed. I arrived in Gowganda by 9pm after having driven 50 miles on the unpaved and snowy Route 560. Ishpatina Ridge PhotoAfter discussing with the owner my various options, he suggested that he take me into the wilderness the 30 miles, drop me off on Scarecrow Lake (which sat at the end of Ishpatina Ridge), and return for me the next day. He insisted that I could get easily lost when following this chain of lakes and portages, and only he knew the area well. He was a volunteer for his local snowmobile club and had just been to Scarecrow Lake two days before by snowmobile, working on creating a wilderness snowmobile trail straight through the wilderness linking to Sudbury. This might seem unduly dangerous to some, but for me, this was simply too limiting. I think one of my main reasons for wanting to climb Ishpatina at this time of year was that I needed to test my winter survival skills and wilderness winter hiking skills, since it had been several years since I last hiked in the winter. In addition to probably being expensive, this option did not provide enough personal freedom and adventure that I desired, and was too controlled. Since the lodge owner had last been on the trail, it had snowed at least 4 inches, which meant that the tracks I planned to follow were most definitely obliterated on the windy lakes. This worried me a bit, but I didn't show it. Because of this, I somehow managed to convince the lodge owner to let rent me his snowmobile so I could set out alone the next morning. He reluctantly agreed after strongly warning me of the thin ice at some of the lake edges and along a section of moving water I had to follow between two lakes on my way to Scarecrow Lake. Of course, he also insisted on renting me a satellite phone and taking my credit card for safe keeping (in case the machine fell through the ice). 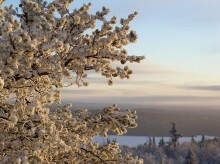 I got up before dawn the next day to temperatures below -30F; the cold spell hadn't let up. After finishing packing, and securing my necessities (including heavy winter clothing, a sleeping bag, and tent) to the snowmobile, I told him to not worry about me unless I didn't return by the following night. Of course, I knew that in these temperatures, I would probably be frozen to death by then if something happened to me, but at the same time, I wanted the freedom to survive on my own in the wilderness in winter without any time constraints. So I set off speeding by snowmobile across the lake from Gowganda, quickly feeling the extreme windchill even through my helmet and windproof jacket. I followed a well-groomed snowmobile trail for several miles on a dirt road that would have been drivable in the summer (and the same road that Not Won in a Day suggests starting from for the northern approach). I then found the start of the wilderness snowmobile trail. 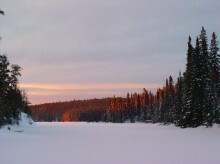 I spent several hours on my snowmobile traveling south across lake after lake, portage after portage. The wild beauty of the land I entered grew stronger the further I rode. 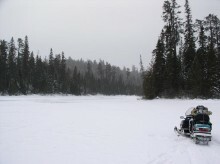 As I suspected, the snowmobile tracks disappeared each time I came out of the woods at the edge of another lake. I used a map and my own intuitive judgment (which I always highly rely upon) to find the portage opening on the far side of the lake where the tracks would commence again. Sometimes it would take several circles and close scrutiny of the shoreline to find where to exit the lake. Traveling by snowmobile across these lakes, sometimes 3 or miles long, was much easier and quicker than if I had chosen to ski or snowshoe all the way in, though very risky. Since it been so extremely cold, I was reasonably sure of the integrity of the ice. However, I rode past numerous outlets and inlets where I knew the ice was thin, and sometimes the portages started on a bank quite near the lake's outlet. At times, I dangerously careened onto dry land as I accelerated near shoreline, rather than slow down while over patches of thinner ice as I approached the shoreline. Despite these dangers, the beauty of the still and frozen landscape was captivating, and I stopped many times to take photographs, only to pull on my mittens with my teeth a minute later when my fingers couldn't move. The trail I followed led me along the banks of what would be flowing water several times, and on top of this danger, I had to remain wary of drifting off into the deep unpacked powder and becoming stuck. I realized the responsibility I had to get back to civilization. 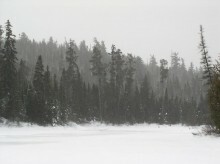 By noon I reached Scarecrow Lake, at the base of Ishpatina Ridge. As an experienced cross country hiker I rely highly on visual sight of my destination to help with my orientation while in the woods. So once I reached Scarecrow Lake, I drove to the far side of the lake to spot the long-abandoned fire tower at Ishpatina's summit. I took a compass bearing for precaution on the tower, parked my snowmobile on the lake, grabbed my pack, put on my snowshoes, and trudged into the woods. There is an old, overgrown trail that leads from the lakeshore to the summit, which I heard can be followed in the summer months. 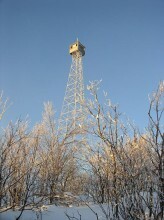 It was used by the rangers who manned the tower in the early 1900's. I managed to find the start of this trail by again careful scrutiny of the lakeshore, and by description, but I soon lost the trail. It is virtually impossible to follow an unmarked and overgrown trail covered in 4 feet of unbroken powder. One cannot tell if an opening in the woods is the trail, or simply a natural divide in the trees. It is possible to examine the bottom of the smaller evergreen trunks to see whether the branches are broken off (indicating a human trail), but this amount of snow covered the trees' trunks high enough to make this futile. I therefore slowly made my way through the mixed woods, trying to recall my own relative position to the position of the Ishpatina Ridge. I worked on gaining a height of land which I thought to be part of the ridge, using tree trunks both large and small to pull myself up with as the deep powder dragged at my heavy feet. An hour and a half had gone by when I reached this height of land. I knew that I was nowhere near the ridge's highest point, but I did know the general direction I needed to travel. I was also not worried about getting lost, because in the winter I could simply follow my tracks back to Scarecrow Lake, although by this time it was 2 pm, I had at least another 2 ½ miles to cover to the top, and sunset was at 5pm. I had left my tent and sleeping bag at the snowmobile to keep my pack as light as possible, and so I knew I had to make the summit by sunset (and trek out following my tracks in the dark), or turn around. To confirm my relative position, and conserve future daylight hours by ensuring I hike on track, I decided I needed to spot the tower from where I was at that point. I did this in an unconventional, though my personal favorite, way. I took off my snowshoes and located a relatively tall cedar tree with full branches. I then shimmied up the first 8 feet of the trunk until I reached branches to step onto, and climbed as far as the size of the branches at the top permitted me to, until I could feel the tree swaying significantly, almost dangerously, as the tree was so brittle in the sub zero temperatures. I scanned with my eyes the ridgeline up ahead, located the tower, took a compass bearing while still up in the tree, and made a mental note of the topography of the land I needed to traverse to reach the top of the long, level ridge. I downclimbed the cedar, and took off towards Ishpatina Ridge. After several grueling hours of snowshoeing and becoming soaked as the firs dumped their loads of snow off their branches and onto me as I pushed through them, I finally reached Ishpatina's ridge crest. I could not seem to find where the tower was, though, so I stopped to rest and eat some cookies I had kept from freezing by inserting them down my pants as I hiked. The -23F temperatures quickly caught up to me, though, and bade me keep moving. I decided to follow the level ridge crest of Ishpatina to the right, which was an educated guess, and finally spotted the tower through ice-laced limbs at 4:30pm. I pushed myself until the summit, and decided to forego my usual [sometimes forbidden] climb of the abandoned lookout because I felt the chill as the sun set behind the horizon. My joy of reaching my first Canadian highpoint was sobered by my long, cold trek that lay ahead. I tried to keep a fast pace on the return back to Scarecrow lake and my waiting snowmobile for as long as I could to keep warm and to take advantage of any waning natural light. Eventually I stopped to put on my headlamp, then continued to push downhill. Ishaptina Ridge PhotoI arrived back at the lake at 8:30pm in total darkness, and decided to camp there rather than try to navigate my way back across the scores of lakes and portages via snowmobile in the dark. I set up my tent right there on the frozen lake as quickly as my cold hands would allow. That night was one of the coldest I have ever experienced. I failed to bring a sleeping pad for insulation from the ground, and shivered all night in my -30F rated sleeping bag. Icicles formed from the inside top of my tent, and frost from my breath coated everything. 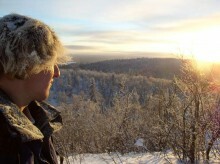 I slept very little that night, and worried about hypothermia in the well below -30F temperatures. When you can't get your boots on, get going. I packed up at 5:30 AM because I didn't want to have to pay an additional day for the rental snowmobile, which would start at 9 am. I also couldn't sleep well because I was so cold, and there wasn't any point in prolonging my misery. My Sorrel boots were so solidly frozen that I could not insert my feet into them past the boot's ankle area. Thankfully, the snowmobile started despite the cold, and I had to start driving for a while with my boots half on, until the engine heat finally thawed them enough for me to slip my feet into. Yet as I started off in the frozen darkness, several steep inclines on the portages ahead worried me. If I couldn't get up those, I would be surely stuck out in the wilderness. My apprehensions were put to rest by a mechanically sound and very stable machine, however, and by skilled, yet wild, driving on my part. I was thankful the lodge owner didn't see what I put his snowmobile through. Sometimes the snowmobile track headed straight across a frozen lake to then climb a ridiculously steep bank on the opposite side of the lake. As I was racing across the frozen lake, I would see the opposite bank rise up almost like a vertical wall. It felt that I was going to have a head-on collision with the steep bank ahead of me, but I knew that if I slowed down to much right before reaching the lakeshore and bank, then I wouldn't have enough momentum to make it up the incline. So, just as I hit dry land and the bank, I would usually close my eyes and lean way back on the snowmobile, and somehow always did go up rather than run into the ground. I witnessed a beautiful sunrise on my return to civilization, and indeed did make it back before 9 am. This experience will always remain a fond memory of mine, for it pushed my abilities to the extreme, and it afforded me beautiful winter wilderness scenery. Ishpatina Ridge was also the memorable and challenging start of another climbing goal. I have since reached a few other eastern provincial highpoints, and continually feel the Canadian mountains calling me back yet again.